So I do have a question that is game related. I assume that the answer is yes give what I read in these threads, but just want to confirm. So when I get the original core set, I can play it with the new core set right? I ask since I was thinking of using them together to have 2 x-wings vs. 4 TIEs at one point. Do starships use fuel? I thought Wedge's parents ran a fueling station, but I realized I wasn't sure what their fuel was/what used the fuel. They do! "Hyperfuel" is what it's usually referred to. Hyperspace travel sips it, and combat dogfighting gulps it. In the X-Wing novels, they even attach drop tanks to X-Wings at one point! @admanb Are you going to the same theater/time as me? 3:50 Regal in Redmond. If so, I'd love to say hi! 10PM at the Redmond iPic for us. Amusingly enough I'll be playing X-Wing at the Redmond game store all day! 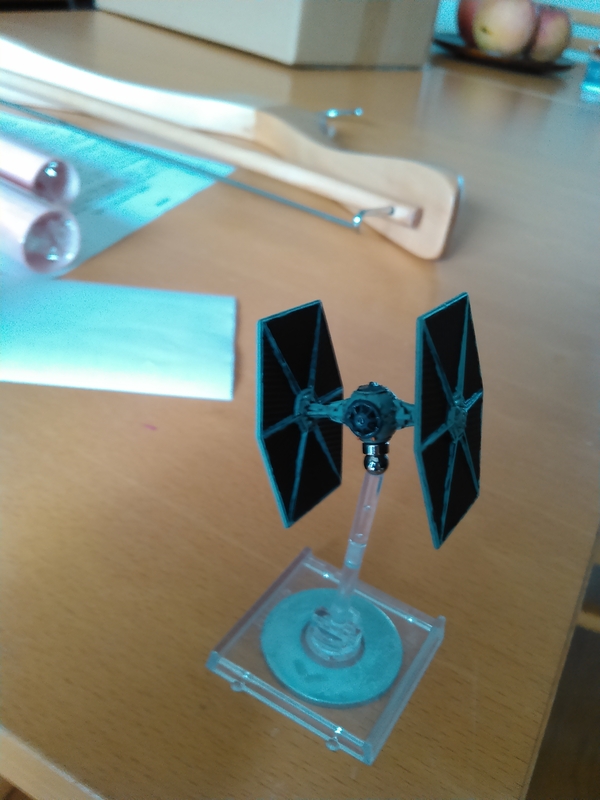 Here's a prototype TIE fighter repaint + base mode I've been working on. Sorry, my phone's camera doesn't do a great job. I've tried a couple of repaints. Inks seem to work well. Is that G&G or Uncle? Either way, enjoy the shooting and the show! The ships in the two different cores are just different ships, just like a Y-Wing is different from a B-Wing, that happen to look almost exactly the same and share a designation that allows them to take certain upgrades. Honestly, the new X-Wing is just flat-out better than the old one. From a competitive standpoint, there's no reason to get the old ones when you could get the new ones instead. Four T-65's and a Z are at a substantial mathematical and tactical advantage over four T-70's. If the T-65's win the initiative roll, they are basically guaranteed victory. If they lose the initiative roll, they are still at an advantage. The three points you pay for the bump to T-70 are a pretty big deal. You get a lot for them, but the opportunity cost is likewise high. For all of it's nifty shenanigans, it's still a jouster. Boost isn't really a big deal, except that it lets you take Autothrusters - but if you do that, you sacrifice the ability to take four of them. The extra Talon Roll options are nice, but are most helpful against big-base turrets as an alternative to K-turn 4. Basically T-65 vs T-70 is a question of your local metagame. If you have a lot of people flying fat turrets, the T-70 is the better option. If not, the T-65 is likely to be more efficient. So I'm line for the movie. Guess we're going twice this weekend! Have to love smartphones with the ability to post while in line to watch the movie. I mainly bought the original core set since it was on sale and I love the original deigns (not to mention my wife does as well). The next repaint should go a lot smoother as I'll probably be able to mask the solar panels off better by using a different brush for the liquid mask. An airbrush makes it easy. Unique pilots is a reason. But on the flip side you definitely want to play the original TIEs. Not a lot of new ships to really pull from. 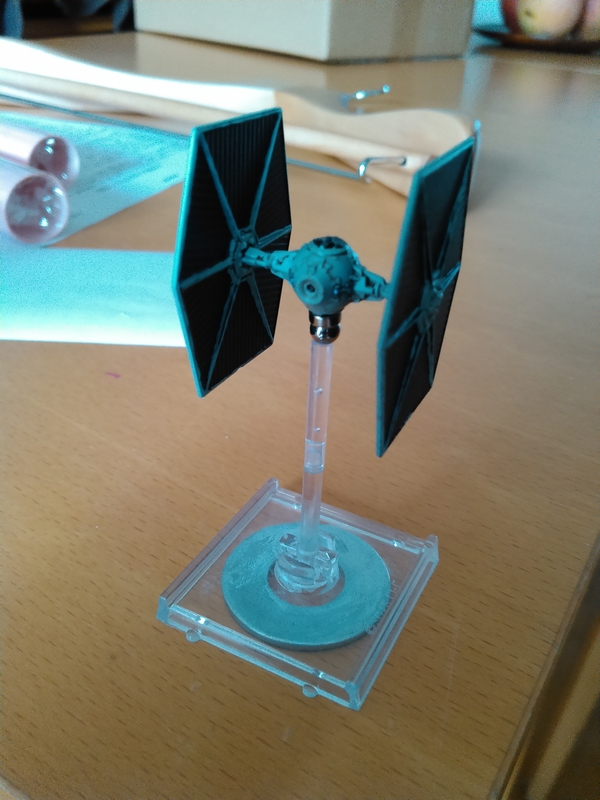 T-70 alt color for Poe's ship and that ship that Ben Vader guy used. Hell, we didn't see any other ships, like the B-wing or A-wings. Not that the movie needed them but for our game, it hurt a bit. Hopefully Rebels will give us some new ships to kill our wallets with. This honestly isn't true. Poe Dameron is what makes the T-70 so widely used - but the ship isn't a clear cut winner. Especially as integrated astromech with a 1 pt droid makes the T65 almost as cost effective a jouster as a B-Wing. How about Rey as a YT pilot? But yeah, I mostly see a recolored T-70 and Kylo Ren's shuttle in our future. T-70 has, in comparison to the T-65, built in engine upgrade (4 points), built in shield upgrade (4 points) and an outright superior dial (unsure how much Tallon Roll or the extra straight green should be worth). It's a p good deal. (though, no, I wouldn't recommend bringing a list of 4 Xs, of any flavor, to a competitive event). Thing is, Engine Upgrade isn't intrinsically worth four points. Neither is Shield Upgrade. If they were, people would be putting them on everything. How many points is Engine Upgrade worth on an Academy TIE? What about Shield Upgrade? They are contingently useful, and the basic X-wing package simply doesn't need them to do it's job. Are they nice to have? Yeah! The T-70 is indeed a pretty good deal. It just doesn't obviate the T-65. Is my current one. Kinda debating going to a generic punisher to free up more points though not sure what I'd use with them. I could totally see there being a Special Forces Title for the TIE/fo that gave it the auxillary firing arc and the ability to use missiles. Yeah, I could see Rey as a YT pilot with the ability "Spend your Target Lock to perform a boost or barrel roll action" and Fin as a crew that rerolls any blanks when you attack or reroll one blank. Fin, in the movie as a gunner seemed like he was getting lucky shots vs. having any skill, so I wouldn't have him turning things into automatic hits or crits. To be fair, in the movie Finn had all of 30 seconds to learn the gunnery systems of the TIE fighter and maybe that much to learn the Falcons and seemed to be under some really nasty PTSD symptoms. The fact that he hit anything at all under those circumstances should be pretty impressive. Luck or not. No fair comparing him to Skywalker in Ep4. Luke had the force helping. And he used to bullseye womprats in his T-16 back home. I think it's time to just come out and say it. The womp rats had it coming. That poor TIE-Fighter (#2) landed full on an asteroid before putting himself in a killzone. Silly Academy Pilots! On the plus side, the wife rolled 3 hits on Biggs dropping him to 2 Hull. This turned out crazy for me after cold dice on her part. Biggs lived and her other ships took minor damage. After this blood bath, the wife missed with her Interceptor and lost it on return fire from Cracken. Kyle cleaned up the severally damaged TIE-Fighter behind the formation. Our youngster needed feeding and she threw in the towel. anyone around for a game? There's the Rebel Transport that I'd be willing to bet would be a large based ship in an upcoming wave. Maybe include a General Leia Organa as a crew card. Sure, it looked like a pregnant B-wing, but it might enable some fun shenanigans. I mean, Imps got the Lambda class shuttle, I'd think that the transport could fill a similar role. Maybe get the rebels some two slot crew like Palpatine? Other than that though, looks like we'll be watching Rebels for new ships in the meantime. Boy, I can't wait so see the movie, so I can read the other half of the posts in this thread. Interestingly, the Visual Dictionary says the Resistance Transports are in fact made from scrapped and surplus B-Wings. If it's any consolation, very few of the spoilers here relate to the plot, we're just talking about ships from the movie that may or may not appear on a tabletop near you. But with the internet in general being up in arms about possible spoilers, it's better to be safe than sorry. I've thought about doing this. Any recommendations on pens? Sharpies? Vallejo Game Inks are what I've had the best results with. Does Hot Shot Blaster count as a secondary weapon for Munitions Failsafe?